A small gesture can go a long way, especially if its dark chocolate filled with delicious creamy peppermint! Make this treat the perfect little gift for a loved one. 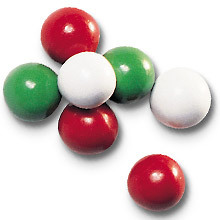 The bag includes creamy peppermint centers dipped in dark chocolate with a mint candy shell in Christmas red, green, and white. Packaged in an 8 oz. bag. NOTE: SHIPPING RESTRICTIONS APPLY - DURING WARM WEATHER, CHOCOLATE AND TAFFY ITEMS CAN BE SHIPPED MON/ TUES/ WED, OVERNIGHT OR 2-DAY AIR ONLY. Shipping restrictions apply May 1st through October 15th. Occasionally, weather can be unpredictable. If the weather in delivery area is above 80 degrees during any month of the year we suggest the package be expedited.